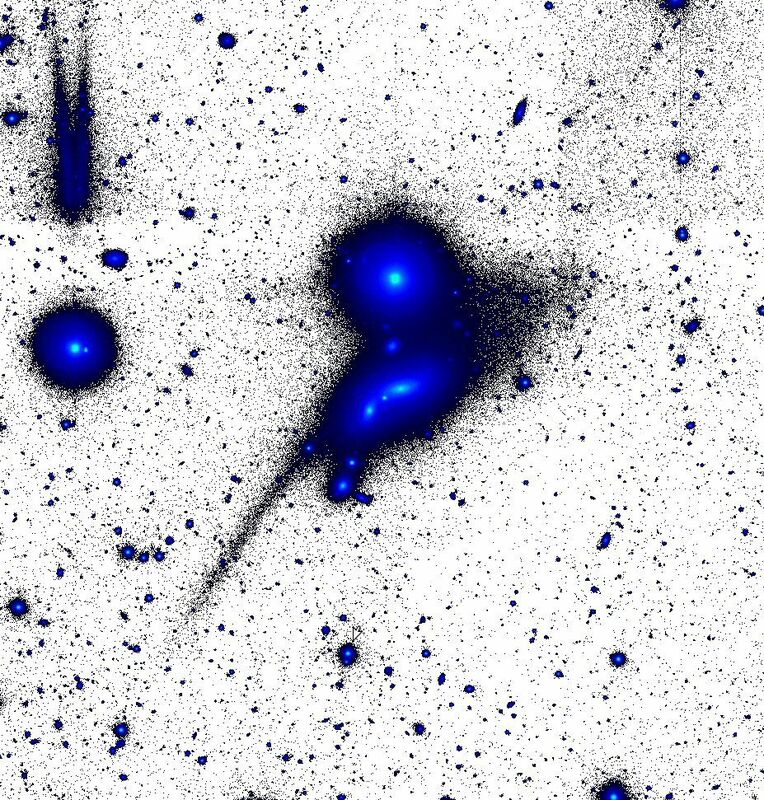 A team of astronomers from Israel, the U.S. and Russia have identified a disrupted galaxy resembling a giant tadpole, complete with an elliptical head and a long, straight tail, about 300 million light years away from Earth. The galaxy is one million light-years long from end to end, ten times larger than the Milky Way. The research is published today in the journal Monthly Notices of the Royal Astronomical Society. “We have found a giant, exceptional relic of a disrupted galaxy,” says Dr Noah Brosch, of The Florence and George Wise Observatory at Tel Aviv University’s School of Physics and Astronomy, who led the research for the study. Drs Brosch and Rich collaborated on the study with Dr Alexandr Mosenkov of St. Petersburg University and Dr Shuki Koriski of TAU’s Florence and George Wise Observatory and School of Physics and Astronomy. According to the study, the giant “tadpole” was produced by the disruption of a small, previously invisible dwarf galaxy containing mostly stars. When the gravitational force of two visible galaxies pulled on stars in this vulnerable galaxy, the stars closer to the pair formed the “head” of the tadpole. Stars lingering in the victim galaxy formed the “tail." “The extragalactic tadpole contains a system of two very close ‘normal’ disc galaxies, each about 40,000 light-years across,” says Dr Brosch. “Together with other nearby galaxies, the galaxies form a compact group.” The galaxy is part of a small group of galaxies called HCG098 that will merge into a single galaxy in the next billion years. Such compact galaxy groups were first identified in 1982 by astronomer Paul Hickson, who published a catalogue of 100 such groups. The Hickson Compact Groups examine environments with high galaxy densities that are not at the core of a “cluster” of galaxies (clusters contain thousands of galaxies themselves). The "tadpole galaxy" is listed as No. 98 in the Hickson Compact Group catalogue. “In compact group environments, we believe we can study ‘clean’ examples of galaxy-galaxy interactions, learn how matter is transferred between the members, and how newly accreted matter can modify and influence galaxy growth and development,” says Dr Brosch. For the research, the scientists collected dozens of images of the targets, each exposed through a wide filter that selects red light while virtually eliminating extraneous light pollution. “We used a relatively small, 70-cm telescope at the Wise Observatory and an identical telescope in California, both of which were equipped with state-of-the-art CCD cameras,” says Dr Brosch. The two telescopes are collaborating on a project called the Halos and Environments of Nearby Galaxies (HERON) Survey. The new work appears in: “Hickson Compact Group 98: a Complex Merging Group with a Giant Tidal Tail and a Humongous Envelope”, N. Brosch, S. Koriski, R. Michael Rich, A.V. Mosenkov, Monthly Notices of the Royal Astronomical Society (2019), 482 (2) (DOI: 10.1093/mnras/sty2717). American Friends of Tel Aviv University supports Israel’s most influential, comprehensive, and sought-after center of higher learning, Tel Aviv University (TAU). TAU is recognized and celebrated internationally for creating an innovative, entrepreneurial culture on campus that generates inventions, startups and economic development in Israel. TAU is ranked ninth in the world, and first in Israel, for producing start-up founders of billion-dollar companies, an achievement that surpassed several Ivy League universities. To date, 2,500 US patents have been filed by Tel Aviv University researchers – ranking TAU #1 in Israel, #10 outside of the US, and #43 in the world. The Royal Astronomical Society (RAS, www.ras.ac.uk), founded in 1820, encourages and promotes the study of astronomy, solar-system science, geophysics and closely related branches of science. The RAS organizes scientific meetings, publishes international research and review journals, recognizes outstanding achievements by the award of medals and prizes, maintains an extensive library, supports education through grants and outreach activities and represents UK astronomy nationally and internationally. Its more than 4,000 members (Fellows), a third based overseas, include scientific researchers in universities, observatories and laboratories as well as historians of astronomy and others.